Mustaches, putty, and rainbows, oh my! This eclectic mix of best-selling novelty toys includes a wide variety of products, but according to the retailers TDmonthly surveyed, Crazy Aaron's Thinking Putty and the ever-trendy Rainbow Loom are the two products at the top. You can see what other novelty toys are hot right now below. No manufacturer paid to be included in this article. All products listed were designated by editorial staff without regard to the company's relationship with TOYDIRECTORY.com/TDmonthly Magazine. Strange Attractor Thinking Putty by CRAZY AARON ENTERPRISES, INC. Deep black with subtle green sparkles, this slightly stiffer Thinking Putty has a mind of its own. Near a powerful magnet it comes alive! Strong enough to defy gravity. It can even lift tacks and paperclips on its own after charging in a magnetic field. One would be mesmerized by the invisible forces at play. — Candace Gooch, owner of At Once All Agog in Limerick, Maine, told TDmonthly in July 2010 that this product is one of her top-three best sellers. She cited sales of 12 in the last month and three in the last week. — In a late Summer 2012 survey, three out of 12 retailers said Crazy Aaron's Thinking Putty was their bestselling novelty item. Richard Gibson, owner of Learning Express of Newton in Newton, Mass., told TDmonthly that the putty brings in $5-6,000 a year, and "the best is the magnetic one." — In a Fall 2013 survey, three out of 12 retailers told TDmonthly that Crazy Aaron's Thinking Putty was their best-selling novelty toy. Package includes: Rainbow Loom(TM), Mini Rainbow Loom(TM), hook, a bag of c-clips, instruction manual and 600+ mix rubber bands (colors may vary). Makes up to 24 rubber band bracelets. — Chris Lowe, owner of Beanhead Toys in Sandy Springs, Ga., told TDmonthly in a May 2013 survey that Rainbow Loom is their best-selling activity kit. They sell about 50 each month, and if they could keep it in stock, would likely sell more. "I got 24 the other day and they were gone instantly," she told TDmonthly. — In a July 2013 survey, four out of 12 retailers told TDmonthly that the Rainbow Loom was their overall best-selling product. — In a Fall 2013 survey, two out of 12 retailers told TDmonthly that Rainbow Loom was their best-selling novelty toy. Other products from OPTARI INC.
Spikeletz bracelets are soft, stretchy, and comfortable to wear. One size fits most. Comes in a variety of colorful styles. — Diana Nelson, owner of Kazoo Toys in Denver, Colo., told TDmonthly in a Fall 2012 survey that Spikeletz were one of her top-2 bestselling jewelry items. They sell through one display each month. — In a Fall 2013 survey, two out of 12 retailers told TDmonthly that Spikelets were their best-selling novelty toys. — In a Fall 2013 survey, two out of 10 retailers told TDmonthly that Spikelets are their best-selling jewelry item. 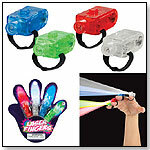 Create your own amazing light show with these sets of mini finger lights. Each set includes four .75 x .5 inch lights with elastic bands. Each light projects a different color. — In a Fall 2013 survey, two out of 12 retailers told TDmonthly that Lazer Fingers were their best-selling novelty toy. “You can be a super star every day!” says the illustrated blister card from Schylling. In assorted shapes, sizes, and colors, Schylling's Self-Adhesive Mustaches are instant personality. Whether for a disguise, fancy occasion, costume, or day-to-day fun, each of the seven mustaches is great for a laugh. — “We sell a ton of those. I'm always amazed at the number of those we sell!” said Greg Larson, owner of Larson's Toys and Games in Columbus, Ohio, of Schylling's Self-Adhesive Mustaches during a September 2010 survey of 49 retailers. — Two of 49 retailers listed Self-Adhesive Mustaches by Schylling as a best-seller in September 2010. — In a late Summer 2012 survey, two out of 12 retailers said that mustaches were their bestselling novelty item. This 1:34 scale car lights up and makes sounds. — Linda Laramy, owner of Crackerjacks Toys and Children's Books in Easton, Md., told TDmonthly in a Summer 2011 survey that she sells 6 of this item each month. — In a Summer 2012 survey, four out of 10 retailers told TDmonthly that Schylling was their best selling brand of die-cast toy. 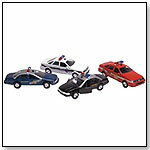 — In an August 2013 survey, two out of nine retailers told TDmonthly that police cars were their best-selling type of die-cast toy. Cute and cuddly, these 6.5 inch soft-bodied dolls have vinyl heads, arms and legs. Assorted outfits. Come in a case of 24. — In a Summer 2011 survey Paula Bolte, owner of Imaginations Toy & Furniture Co. in Blacksburg, Va., told TDmonthly that she sold about 24 Mini Babies each month. — In a Fall 2013 survey, Kim Emigh, manager of e-commerce at Growing Tree Toys in State College, Pa., told TDmonthly that Mini-Babies from Toysmith were one of their best-selling novelty toys. Each of the 16 all-new minifigures come in a sealed "mystery" bag, so kids never know which minifigure they might get. And each minifigure has its own special accessories, display plate and collector's leaflet. Series 7 includes: Aztec Warrior, Evil Knight, Galaxy Patrol, Jungle Boy, Viking Woman, Ocean King, Grandma Visitor, Rocker Girl, Tennis Ace, Computer Programmer, Bride, Swimming Champion, Daredevil, Bunny Suit Guy, Hippie and Bagpiper. — In a Summer 2012 survey, Deran Muckjian, owner of Catch a Falling Star in Lexington, Mass., told TDmonthly that "Lego continually sells really well, across the board, for boy gifts," and that the LEGO minifigures were an overall best seller. — In a late Summer 2012 survey, two out of 12 retailers said that LEGO minifigures were one of their bestselling novelty items. — In a July 2013 survey, two out of 12 retailers told TDmonthly that LEGO minifigs are their best-selling toy. Turbo Twister by MINDSCOPE PRODUCTS INC.
Other products from MINDSCOPE PRODUCTS INC. This RC Stunt Car with lights on the wheels comes in its original box. Highly detailed features make this car one of a kind. It comes with a fully functional remote which allows the car to move forward, reverse, left and right. — Megan Pettit, manager of The Toy Maven in Dallas, Tex., told TDmonthly in a July 2013 survey that the Turbo Twister is her store's overall best-selling toy. — In a July 2013 survey, two out of 12 retailers told TDmonthly that the Turbo Twister was their best-selling electronic or battery-operated toy. — In a Fall 2013 survey, Mike D'Andrea, manager of e-commerce at Hardware Center & Toys in Paoli, Pa., told TDmonthly that Turbo Twister was one of their best-selling novelty toys. Box of 36 assorted Scorpion Suckers. Blueberry, banana, apple, & strawberry flavors. Hard candy with a real scorpion inside. — In an October 2011 survey about bestselling food and candy, John Blair, owner of Science Safari in Cary, N.C. told TDmonthly that they sell a dozen of these insect lollipops each month, "sometimes to kids, sometimes to adults as a gag gift." — John Blair, owner of Science Safari in Cary, N.C., told TDmonthly in a late Summer 2012 survey that Scorpion Suckers were one of his best selling candies. •Activision Files Lawsuit Against Worlds Inc.
•Will The Government Shutdown Affect Holiday Retail? •Happy Birds: May the Force be With You!